I am a third-generation Mexican-American. My earliest memories were in the house of mi abuelita. I remember the constant sound of music and television in Spanish. When I was 4 years of age we moved. We still lived near other Mexican-Americans at this time, but it was not long until my mother and father saved enough money for us to move out of there as well. At the age of 7, we settled in a predominately White-American suburb in Arlington, Texas. There was no longer anyone who looked like us or spoke like us, and my parents wanted me to fit in. I had no means of talking to anyone other than my grandmother and sometimes my parents since it was the only time I could freely speak Spanish. I could no longer communicate with my own heritage and culture. Except for when I spoke through my body. When I danced to salsa, bachata, merengue, and cumbia I was Latino again. The irony of it all was that because of how I moved I could be from any part of Latin America I so choose. I did not have a specific Mexican identity; instead I could be as many different types of Latino as I wanted, so long as the music covered my voice. Over time, I found others like me; the silent ones, the in-betweeners. They reached out to me for some reason unbeknownst to me. I could not teach them all the Spanish I had just re-acquired or teach them all our culture when I am still learning more about it everyday. What could I do? I could teach them to dance! It was my ticket into a world I thought I would never know. So I did, I created a whole program through IU’s Latino Cultural Center, known as La Casa. Paso a Paso is a cultural program dedicated to educating the Bloomington, IN community about Latino culture through dance. I was dedicated to helping as many of those like me as possible, those who were lost. I was so eager to put on this program and help the Latino community I almost missed the most important reason I dance. I did not want to let anyone feel the anger, despair, hopefulness, and utter frustration I felt just going up to people who I called family, let alone those who share in my image. I dance because I feel like I am a part of something greater than myself when I do, I feel as if I am whole again, I feel accepted. It is a week before my first workshop for Paso a Paso and I am spamming IU’s email servers with my flyers, I am going into classes and hanging up flyers so that at least one person can come to my event. That is when I spoke to my advisor to make a quick call out to the Anthropology of Dance class. My classmates seemed interested, at least I hoped so, but there was one person who was disheartened at my entreaty for everyone to attend. Her name is Sally, and she uses a wheelchair. She told me that she would love to come but she can’t “move the way” I do. In that moment, my past was reflected in her eyes; mirror’s curse and blessing. I told her, “Don’t worry! I know exactly how to teach you to dance!” I lied. I had no idea. But I couldn’t let her feel the way I have felt. I can never let anyone feel that way again if I have the means to do so. Exclusion to some is exile to others. At the edge of oblivion in the minds of those who feel isolation, a single step in either direction can change the whole dance. It might as well be to a rhythm. I scoured the Internet for someone who has done this before, but there was no one. Anything I found was a routine that was choreographed, rehearsed, and performed. That isn’t what I wanted. I wanted expression. I want the dancer to do what he/she wants in the moment before the moment disappears because in the fleeting instant he/she is making a choice what to do and who to be. So I worked every passing second on a way for her to learn to do Latin dance. I spent what seemed like forever creating a method to teach her to be a part of a community she thought was lost to her. Hours and hours creating scenarios for every possible question, concern, and issue that she had. I looked up different wheelchairs and their mechanics. Finally, the day came. Sally and her partner John came to my program. I discussed the history of Latin Americans coming to the U.S., I focused on a particular dance known as Bachata, and I discussed how it has gained popularity over time. As my other instructors began teaching the basics I worked with Sally and John, making sure they were also paying attention to what was happening around them. My standing/sitting partner pair was ready to dance. I developed a series of non-verbal hand gestures that could effectively communicate the direction of the dance. This method also allows for incorporating underarm turns and accounts for time disparities when keeping up with the beat. Sally and John could dance. Their faces were in utter disbelief. Joy radiated from their bodies. The embodiment of acceptance, of laughter, of wholeness, of delighted identity all emanating from what some thought wasn’t a perfect body. I wish I could elaborate more of the details of my method and show images of the performance but you must wait. 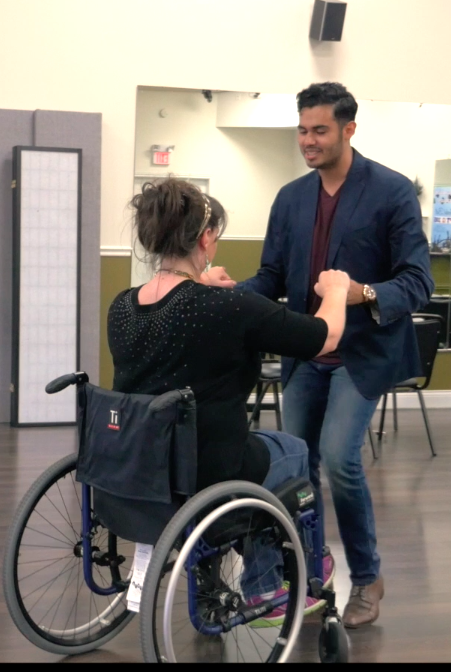 I am currently working on an article to show what was done that day and I have already created an instruction video in conjunction with the future publication that I will use to teach others how to socially dance to Latin music without routine. I will be discussing challenges, body mechanics, what to look out for, safety, and how to never let anyone take away something that is part of you. This experience has changed the way I think and feel about dance. All my preconceived notions of what dance was and who can dance are gone. One thing, especially for me as a hot-blooded stubbornly prideful Latino male, is the change in roles of partnership. My next entry will be focused on partnership between standing and sitting partners. Gabriel J. Escobedo is a PhD Student in the Department of Anthropology at Indiana University. He focuses on dances from Latin America and how U.S. Latino youth utilize these dances to form identity. His current work focuses on Bachata dance and its recent growth it popularity and legitimacy.